Everton captain Phil Neville scored a stunning extra-time winner as Everton came from behind to beat West Brom in the third round of the Carling Cup. Chris Brunt gave the visitors the lead from the penalty spot after Peter Odemwingie had been fouled by Everton goalkeeper Jan Mucha. But a minute from the end Marouane Fellaini struck an equaliser from the edge of the box to force extra time. Neville curled the winner into the top corner after Royston Drenthe's run. 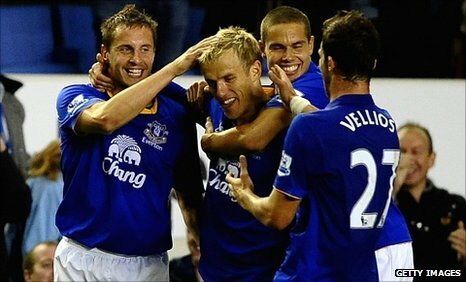 Neville, who has lost his place in the Everton first team to Tony Hibbert, embraced his return with an accomplished finish. Somen Tchoyi's through-ball sent Odemwingie clean through and as Mucha raced off his line the fully committed goalkeeper swept the Nigerian striker off his feet. Phil Neville has scored his first ever League Cup goal in his 29th appearance (17 for Man Utd, 12 for Everton). The goalkeeper escaped with a yellow card for his foul and Brunt powered in the penalty. But with a minute of normal time remaining Fellaini's well-controlled volley from the edge of the area found the bottom corner of the net to force extra time. Odemwingie could have won it in the fifth minute of added time after a mazy run took him past Phil Jagielka and Mucha but his angled shot flew over. Neville did not make the same mistake in the 103rd minute when Drenthe cut the ball back to him and he curled a left-footed shot past Marton Fulop from 25 yards. "We know Roy's teams are well organised and tough to beat and we found it difficult to break them down. "Luckily right at the death, Fellaini pops up with a great goal and into extra-time Phil Neville produces a wonder-strike to win it. "We are delighted we are in the hat for the next round." "It is very easy to draw a line under this and move on. "Any game you lose, even if it's in extra-time after a good performance, you don't feel great about it but on the other hand our priority is the league. "Our goal is not to win the League Cup it is to get another season in the Premier League and, to be quite frank, it can be counter-productive for teams like ourselves." 120:00+2:03 The match has finished after extra time. 120:00+1:19 Free kick awarded for a foul by Craig Dawson on Apostolos Vellios. Tim Cahill restarts play with the free kick. 120:00+0:37 Tim Cahill gives away a free kick for an unfair challenge on Somen Tchoyi. Graham Dorrans takes the free kick. 119:52 Paul Scharner gives away a free kick for an unfair challenge on Royston Drenthe. Phil Neville restarts play with the free kick. 118:27 Paul Scharner takes a shot. Save by Jan Mucha. Chris Brunt takes a inswinging corner to the near post, save made by Jan Mucha. Corner taken by Chris Brunt from the right by-line, free kick awarded for a foul by James Morrison on Jan Mucha. Jan Mucha restarts play with the free kick. 117:20 Magaye Gueye takes a shot. Blocked by Somen Tchoyi. Outswinging corner taken left-footed by Leighton Baines from the left by-line, clearance made by Gareth McAuley. 112:30 Unfair challenge on Royston Drenthe by Chris Brunt results in a free kick. Johnny Heitinga takes the direct free kick. 110:52 Free kick awarded for an unfair challenge on Paul Scharner by Tim Cahill. Chris Brunt produces a strike on goal direct from the free kick. 109:58 Free kick awarded for an unfair challenge on Phil Neville by Paul Scharner. Free kick taken by Jan Mucha. 109:04 Apostolos Vellios is caught offside. Marton Fulop restarts play with the free kick. 107:32 Corner taken by Leighton Baines from the left by-line played to the near post, Jack Rodwell produces a left-footed shot from deep inside the penalty box which goes wide of the left-hand post. 107:12 Free kick awarded for an unfair challenge on Tim Cahill by Peter Odemwingie. Johnny Heitinga takes the direct free kick. 105:01 The match restarts for the second half of extra time. 105:00+0:19 Corner taken right-footed by Graham Dorrans to the near post, clearance made by Marouane Fellaini. 104:37 Foul by Magaye Gueye on Paul Scharner, free kick awarded. Chris Brunt crosses the ball in from the free kick, Apostolos Vellios makes a clearance. 103:44 Substitution (West Brom) makes a substitution, with Craig Dawson coming on for Jonas Olsson. 102:49 The assist for the goal came from Royston Drenthe. 102:49 GOAL - Phil Neville:Everton 2 - 1 West Brom A goal is scored by Phil Neville from just inside the penalty area to the top left corner of the goal. Everton 2-1 West Brom. 101:51 The referee penalises Royston Drenthe for handball. Marton Fulop restarts play with the free kick. 98:01 Chris Brunt takes a inswinging corner to the near post, clearance made by Marouane Fellaini. 94:58 Substitution Paul Scharner on for George Thorne. 94:58 Somen Tchoyi produces a left-footed shot from close range which goes wide of the left-hand post. 93:02 Somen Tchoyi takes a shot. 91:11 Handball by Peter Odemwingie. Johnny Heitinga takes the direct free kick. 90:52 Jack Rodwell takes a shot. Blocked by George Thorne. 90:00+4:23 The whistle goes to signal the end of normal time, with extra time looming. 90:00+3:09 Royston Drenthe takes a shot. Blocked by Jonas Olsson. Inswinging corner taken left-footed by Royston Drenthe from the right by-line, save made by Marton Fulop. 90:00+2:27 Somen Tchoyi challenges Phil Jagielka unfairly and gives away a free kick. Johnny Heitinga takes the free kick. 90:00+2:05 Apostolos Vellios is caught offside. Free kick taken by Marton Fulop. 90:00+1:19 Effort from the edge of the area by Peter Odemwingie goes wide of the right-hand upright. 90:00+0:07 Headed effort from deep inside the area by Jack Rodwell misses to the right of the goal. 89:10 Jack Rodwell takes a shot. Jonas Olsson gets a block in. 88:08 The assist for the goal came from Apostolos Vellios. 88:08 GOAL - Marouane Fellaini:Everton 1 - 1 West Brom Goal scored by Marouane Fellaini from the edge of the area to the bottom right corner of the goal. Everton 1-1 West Brom. 86:57 Unfair challenge on Apostolos Vellios by Billy Jones results in a free kick. The free kick is swung in left-footed by Leighton Baines, clearance by George Thorne. 85:15 Johnny Heitinga challenges Peter Odemwingie unfairly and gives away a free kick. Free kick crossed by Chris Brunt, save by Jan Mucha. 85:01 Marouane Fellaini takes a shot. Comfortable save by Marton Fulop. 82:40 Substitution James Morrison replaces Simon Cox. 81:01 Unfair challenge on Apostolos Vellios by Jonas Olsson results in a free kick. Shot comes in from Leighton Baines from the free kick. 80:03 Marouane Fellaini takes a shot. Save made by Marton Fulop. 79:15 Marouane Fellaini fouled by Joe Mattock, the ref awards a free kick. Free kick crossed left-footed by Leighton Baines, Gareth McAuley makes a clearance. 78:20 Substitution Magaye Gueye comes on in place of Seamus Coleman. 78:20 Headed effort on goal by Apostolos Vellios from inside the penalty box misses to the right of the target. 77:35 The assistant referee signals for offside against Apostolos Vellios. Marton Fulop restarts play with the free kick. 73:22 Shot by Graham Dorrans from outside the box goes over the net. 69:44 Free kick awarded for an unfair challenge on Gareth McAuley by Tim Cahill. Jonas Olsson restarts play with the free kick. 67:29 Free kick awarded for an unfair challenge on Somen Tchoyi by Phil Neville. Free kick taken by Graham Dorrans. 66:57 Free kick awarded for an unfair challenge on Graham Dorrans by Royston Drenthe. Free kick taken by Marton Fulop. 65:17 Inswinging corner taken by Chris Brunt. 62:56 Direct free kick taken by Marton Fulop. 62:56 Booking Royston Drenthe goes into the referee's book. 62:49 Foul by Royston Drenthe on Billy Jones, free kick awarded. 61:23 Substitution Apostolos Vellios joins the action as a substitute, replacing Ross Barkley. 61:23 Substitution (Everton) makes a substitution, with Tim Cahill coming on for Denis Stracqualursi. 60:42 Somen Tchoyi takes a shot. Phil Neville gets a block in. 56:11 Assist on the goal came from Peter Odemwingie. 56:11 GOAL - Chris Brunt:Everton 0 - 1 West Brom Power penalty scored by Chris Brunt. Everton 0-1 West Brom. 55:05 Booking Jan Mucha goes into the book. 54:55 Penalty awarded for an unfair challenge on Peter Odemwingie by Jan Mucha. 54:04 The referee blows for offside against Peter Odemwingie. Johnny Heitinga takes the free kick. 52:01 Corner taken left-footed by Chris Brunt from the right by-line, George Thorne has an effort at goal from deep inside the area missing to the left of the goal. 51:24 Graham Dorrans takes a inswinging corner from the left by-line to the near post, Phil Jagielka manages to make a clearance. 49:42 Shot from 12 yards by Denis Stracqualursi. Save by Marton Fulop. 49:25 George Thorne gives away a free kick for an unfair challenge on Denis Stracqualursi. Direct free kick taken by Royston Drenthe. 47:47 Seamus Coleman takes a shot. Save by Marton Fulop. 45:00+1:00 The referee calls an end to the first half. 42:21 Simon Cox fouled by Jack Rodwell, the ref awards a free kick. Free kick taken by Marton Fulop. 41:16 Outswinging corner taken from the left by-line by Leighton Baines, Peter Odemwingie manages to make a clearance. 40:33 Peter Odemwingie challenges Ross Barkley unfairly and gives away a free kick. Jack Rodwell restarts play with the free kick. 40:17 Chris Brunt challenges Seamus Coleman unfairly and gives away a free kick. Seamus Coleman takes the direct free kick. 39:25 Outswinging corner taken by Graham Dorrans from the left by-line played to the near post, Marouane Fellaini makes a clearance. 37:43 Denis Stracqualursi concedes a free kick for a foul on Jonas Olsson. Jonas Olsson takes the free kick. 35:58 Free kick awarded for an unfair challenge on Leighton Baines by Chris Brunt. Johnny Heitinga takes the free kick. 35:00 Free kick awarded for an unfair challenge on Somen Tchoyi by Johnny Heitinga. Chris Brunt delivers the ball from the free kick left-footed from right channel. 33:49 Free kick awarded for a foul by Leighton Baines on Peter Odemwingie. Chris Brunt delivers the ball from the free kick left-footed from right channel. 32:12 Royston Drenthe crosses the ball, Jack Rodwell produces a left-footed shot from just outside the box that misses to the right of the goal. 32:12 Booking Booking for Graham Dorrans. 32:09 Graham Dorrans gives away a free kick for an unfair challenge on Seamus Coleman. 29:29 The referee blows for offside. Jan Mucha restarts play with the free kick. 27:04 Headed effort from deep inside the area by Marouane Fellaini misses to the right of the target. 26:31 Corner taken by Royston Drenthe from the right by-line to the near post, Somen Tchoyi manages to make a clearance. 26:04 Seamus Coleman is adjudged to have handled the ball. Direct free kick taken by Jonas Olsson. 25:32 Peter Odemwingie produces a right-footed shot from the edge of the box and misses to the right of the target. 23:44 Unfair challenge on Denis Stracqualursi by Jonas Olsson results in a free kick. Royston Drenthe restarts play with the free kick. 20:31 Unfair challenge on Peter Odemwingie by Royston Drenthe results in a free kick. Gareth McAuley takes the free kick. 20:09 Graham Dorrans challenges Ross Barkley unfairly and gives away a free kick. Phil Jagielka restarts play with the free kick. 18:53 Free kick awarded for a foul by George Thorne on Royston Drenthe. Free kick taken by Royston Drenthe. 16:56 Graham Dorrans concedes a free kick for a foul on Ross Barkley. Royston Drenthe has an effort direct from the free kick. 15:33 Somen Tchoyi produces a right-footed shot from the edge of the box and misses to the right of the target. 14:18 The referee gives a free kick against Phil Neville for handball. Simon Cox restarts play with the free kick. 8:52 Free kick awarded for a foul by Graham Dorrans on Denis Stracqualursi. Marouane Fellaini restarts play with the free kick. Denis Stracqualursi takes a shot. Blocked by Joe Mattock. Effort on goal by Denis Stracqualursi from deep inside the penalty area misses to the right of the goal. 7:48 Somen Tchoyi has an effort at goal from outside the area which goes wide right of the goal.